This is a little bit spicy and very moist burger. Plan on using a grill pan, or skillet because it's so moist it will fall through the BBQ grates. I recommend serving the burger with a salad, it's a nice counterbalance to the spices. You might have to add a few Korean ingredients to your shopping list but it will be well worth it. With the motor running, drop the garlic and ginger into a food processor and process until finely chopped. 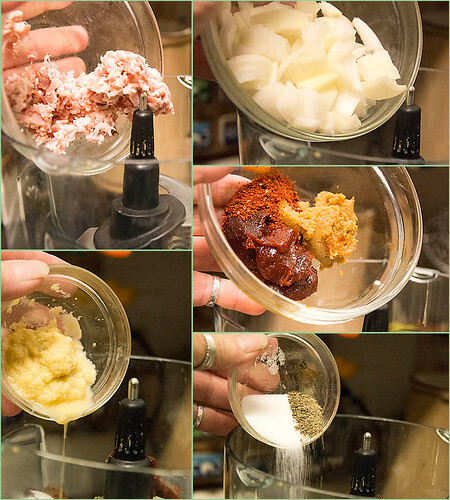 Since I buy a paste of garlic and ginger I can skip that step and just add the paste along with the pancetta, onion, chile flakes, soybean paste, chile paste, sugar and pepper to the food processor. Process into a smooth paste. then add the paste and gently mix together with your hands. Cook in a skillet, flipping once until browned and cooked through. Mmmm time to dive in. The recipe calls for serving it on a bun with some Korean condiments. I didn't use them but I included those recipes too. With the motor running, drop the garlic and ginger into a food processor and process until finely chopped. Add the pancetta and pulse until finely chopped. 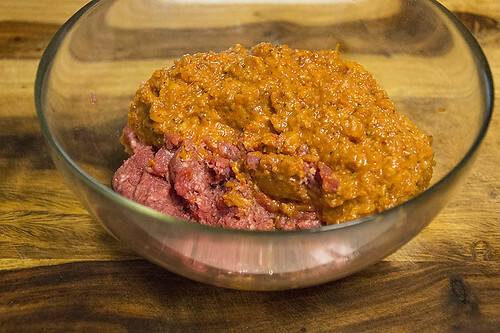 Add the onion, chile flakes, soybean paste, chile paste, sugar, and pepper and process until fairly smooth. Set the pancetta mixture aside. 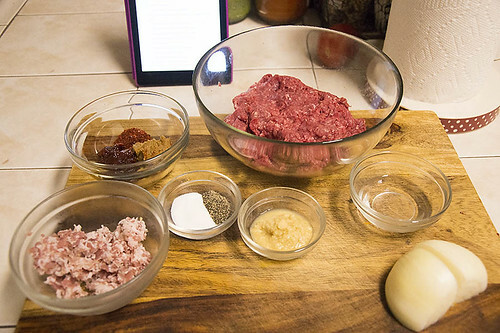 Crumble the beef into a large bowl. Add the seltzer, sesame seeds, and pancetta mixture and gently mix together with your hands, being careful not to overwork the mixture. 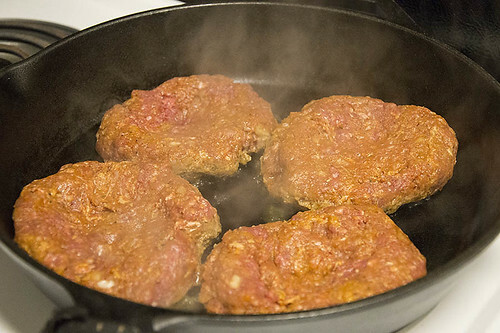 Form the mixture into four patties, each about 1 inch thick and 4 inches wide. 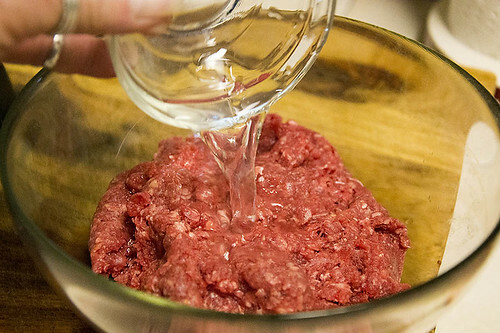 Create a depression in the center of each patty, as burgers tend to rise in the middle during cooking and this will help the burgers come out flat. If not cooking immediately, cover the patties and refrigerate. In a large skillet, heat the oil over medium-high heat. Lightly season the burgers with salt, if necessary. Put them in the skillet depression-side up and cook, flipping halfway through, until browned and cooked through about 7 minutes. Meanwhile, heat a two-burner griddle/grill pan or skillet over medium-high heat. Spread both sides of the buns with the butter and cook cut-side down until lightly toasted about a minute. If working in batches, toast the bottom buns first. Transfer to individual plates. Put a burger on each bottom bun and top with lettuce and then the cucumber kimchi. 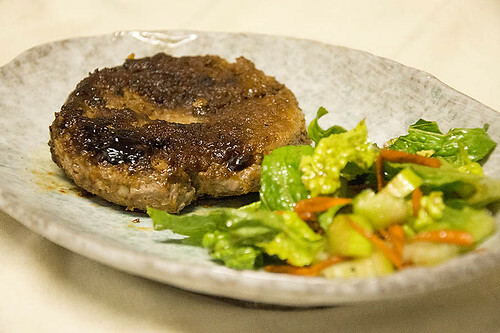 Smear some Korean ketchup and doenjang mayonnaise on the top buns and place on the burgers. Secure with a bamboo skewer or long toothpick, if you like, and serve. It may seem crazy to fix it when it ain’t broken, but I’ve Koreanized burgers and thrown in some pancetta to boot. Since pancetta is pork belly and a beloved cut in Korea, it just seemed to make sense. To me, at least. Sometimes you have to take these risks to come up with something phenomenal. MAKES ABOUT 1 QUART One of the most beloved versions of kimchi takes a bit of time, but you’ll be pleasantly surprised by the results. This kimchi tastes great on top of my Krazy Korean Burgers as well, as a different take on the American pickle. Using a small knife, cut each cucumber crosswise into 2-inch pieces. Stand the pieces on their cut sides and cut each one two-thirds of the way down into quarters, keeping them attached at the bottom. Sprinkle the cucumbers with the salt, spreading the cucumbers open to get the salt deep inside the cuts. Arrange the cucumbers with their cross cut sides up in a single layer in a glass or other nonreactive container, at least 2 inches tall, with a tight-fitting lid, cover, and let soften at room temperature for 30 minutes to 1 hour. 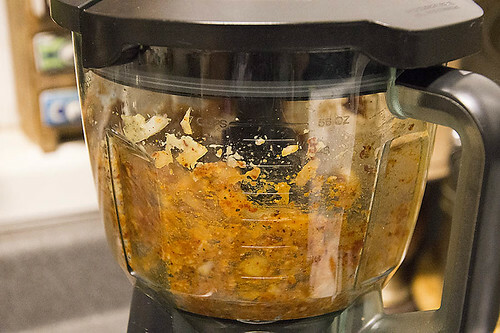 Meanwhile, in a food processor, combine the onion, scallions, chile flakes, shrimp, garlic, ginger, and 2 tablespoons water. Pulse until a coarse spice paste forms and then stir in the chives. Rinse the salted cucumbers well under cold water, making sure to rid the crevices of all the salt. Shake dry and then press the spice paste all over and into the crevices of each piece. Return the cucumbers to the (rinsed) container, cross cut sides up, packing them somewhat tightly and pressing in any remaining spice paste and liquid. Cover and let the cucumbers ferment at room temperature for about 24 hours. Refrigerate until ready to serve. Use this on burgers, like my Krazy Korean Burgers and as a dipping sauce for fries. In a small bowl, stir together the ketchup and chile paste. Cover and store in the refrigerator if not using immediately. Use this simple, umami-rich condiment as a dipping sauce and slathered on the Krazy Korean Burgers or grilled corn, and pretty much anywhere else you would use mayo. In a small bowl, whisk together the mayonnaise and soybean paste until smooth. Cover and store in the refrigerator if not using immediately.